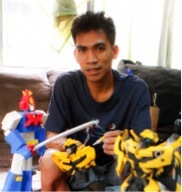 the latest among our countrymen to be recognized on the international stage for his brilliance.Last September, Elmer Padilla made headlines when his handmade action figures, made of recycled tsinelas, were posted on Facebook. He has since made an appearance on Kapuso Mo,Jessica Soho, and his work was even handed to Thor: Ragnarok actors Chris Hemsworth and Mark Ruffalo, who praised Elmer’s depictions of their characters. noong magstart ako sa paggawa. Hindi pa po character ang mga ginagawa ko noon. Bangka-bangka lang po gamit ang mga tsinelas na sira hanggang sa nakakabuo na ako ng mga robot sa sarili kong imahinasyon. 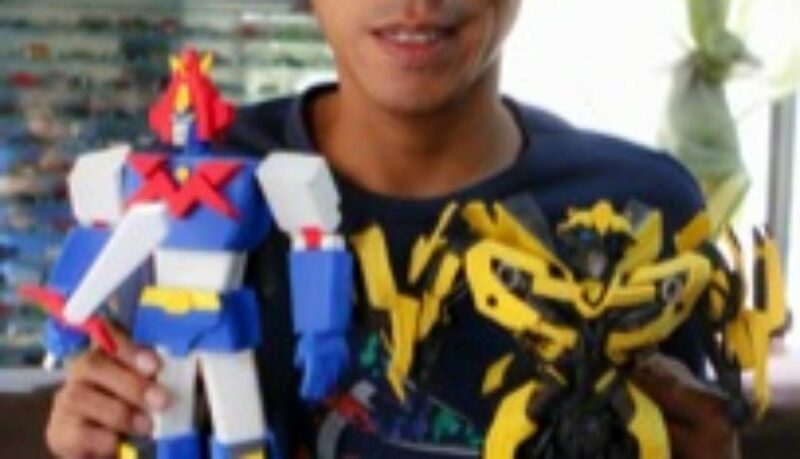 Hanggang sa nahilig ako sa mga action figures sa movie. able to make robots of my own imagination. Then, I began taking an interest in action figures from movies. At that point, I tried imitating action figures. ),” he said. 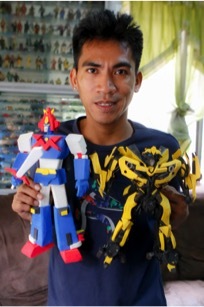 Originally hailing from Samar, Elmer, his wife, and two daughters recently moved to Imus, Cavite to try and fulfill his dream of making and selling action figures. It was here that he was discovered selling his tsinelas action figures on the streets, and from there, his fame skyrocketed. he can barely keep up with demand. “Actually, sa isang araw, nakakatanggap kami ng 70 orders. Yung iba hindi na niya nasasagot sa social media dahil nga medyo busy na rin talaga. Akala nila suplado si Elmer pero talagang marami lang talagang dating ng order. (Actually, in asingle day, we can receive up to 70 orders. He can’t respond to the others on social media because he’s really busy. They think Elmer is being snobbish, but really, there are just so many orders coming in. ),” Jerry Santos said. Elmer’s primary expense in making his action figures has been the purchase of MIGHTY BOND.Sometimes, when he runs out of money, he’d just buy ordinary shoe glue, but this lowers the quality of his work. “Kapag ordinaryong shoe glue lang talaga, madaling matanggal ang dikit kapag natutuyo na. Kapag MIGHTY BOND ang gamit ko, mabilis dumikit at matibay kahit na yung sa mga parte pa ng action figures na mahirap dumikit gaya nung mga wires at plastic. (When I use just ordinary shoe glue, the stickiness easily fades when it dries. 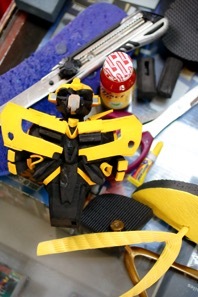 When I use MIGHTY BOND, it sticks quickly and it stays sturdy, even with the parts of the action figures that are hard to glue like wires and plastic. ),” he said. Right now, Elmer’s income from his craft remains a little slow, as it’s just him working on fulfilling the orders. Already, though, he’s being courted by international flip-flop brands hoping to become his supplier. 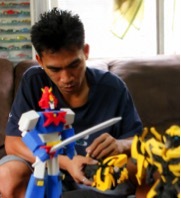 And in the coming days, he’s going to personally hand action figures to President Duterte and President Trump, during the ASEAN Summit. In spite of rising fame and fortune, Elmer’s dreams remain squarely grounded at home. He wants to be able to buy a house for his family, and buy whatever they need. With all the hard work he puts in for his family, he truly is as good as the superheroes he depicts.